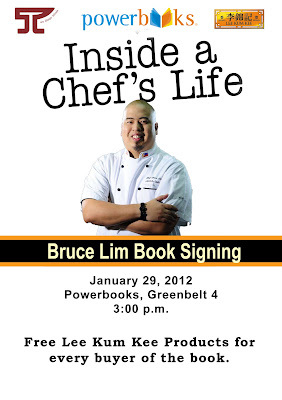 Anvil Publishing in cooperation with Lee Kum Kee release the first cookbook of Asian Food Channel show host Bruce Lim entitled INSIDE A CHEF’S LIFE. The book is a collection of close to 60 recipes that trace the development of Chef Bruce from an avid foodie to a culinary professional. It virtually takes the reader inside a Chef’s kitchen as Bruce shares tips and techniques that they practise in his restaurants. Bruce Lim was introduce d to the public via Asia Food Channel in Tablescapes, a food and travel show in 2008. Due to the warm reception of viewers around ASEAN, Bruce launched his second show called Chef’s Table and more recently The BOSS in AFC and has been receiving good reviews because of the innovative yet easy to follow recipes that are regularly featured in his shows. The recipes reflect the cultural milieu and vision of this young chef who was born in the Philippines, raised in a Chinese household and studied in the US. Dishes like Stuffed Chicken adobo with crispy pork flakes, black rice with seafood, eggplant and pork frittata with salted eggs, sisig pasta, buko pie martini, steamed lapulapu on ube mash, tapsulog with atchara and banana mango jubilee deliciously blend western culinary techniques with Pinoy staples. All recipes are guaranteed to be reproducible in one’s home kitchen. wow Chef Bruce nasa Book na!! well popular na tlaga sya!! !